1066: The Year of Three Battles covers the crucial year in the history of England when three men vied for the throne: Harold Godwinson, king of Wessex, Haraldr Sigurdsson (known as Hardrada), king of Norway, and William, Duke of Normandy. 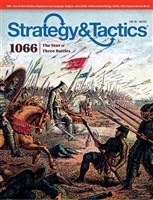 The game presents the three main battles of the campaign — Fulford (20 September), Stamford Bridge (25 September), and Hastings (14 October) — using the Battles of the Medieval World system. Each battle has its own map, with hexes approximately 55 yards across. Units represent around 200 men and are typed as infantry, archers, and cavalry. Turns are 30 minutes of real time. Combat features a simple odds-based CRT with special rules covering archery and cavalry charges. Key leaders are present and affect unit morale and rally. Each of the games can be played in two hours or less. Players also may choose the campaign scenario, fighting all three battles in sequence, with the outcome of each affecting the forces available in the next.